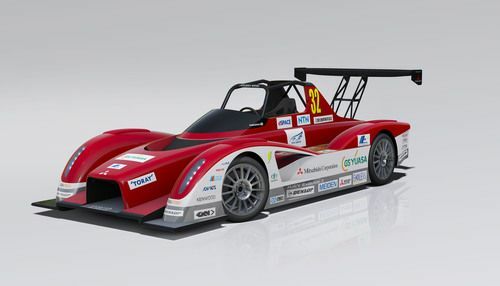 The 2013 Pikes Peak Hill Climb, which already had several high profile electric car and motorcycle entries, has two more with an entry by Mitsubishi of two electric race cars. The electric racing feast at the 2013 Pikes Peak International Hill Climb was taken to a whole new level with the entry of two electric cars from Mitsubishi. The two cars in the June 30 race are all-new MiEV Evolution II all-electric four-wheel drive (4WD) prototype racecars. Like other electric entrants in the 2013 PPIHC, the Mitsubishi team is looking for an outright win. The Pikes Peak race is a yearly time trial race to the 14,110 foot summit of Pikes Peak near Colorado Springs. Racers climb about 4700 feet total altitude gain, and for the gasoline powered race vehicles part of the challenge is the thinning atmosphere affecting combustion. Electric vehicles have an advantage because they do not require combustion, and operate equally well in any atmospheric condition. Mitsubishi entered the 2012 PPHIC with the i-MiEV Evolution all-electric prototype, finishing second in the Electric Vehicle division. Last years participation gave Mitsubishi engineers a wealth of information on battery pack behavior, electric motor temperature and other key information on electric vehicle design and component choices. Driving the two MiEV Evolution II are a pair of champion race car drivers, two-time Dakar Rally champion and MMC vehicle development/test driver Hiroshi Masuoka and six-time PPIHC motorcycle champion Greg Tracy. In 2012 Masuoka drove the first generation of this race car, placing 8th place overall, and 2nd place in the Electric division to the Toyota entry. The MiEV Evolution II has an innovative four-motor (two-front/two-rear) drivetrain, and for the 2013 model they've added a high-tech Super All-Wheel Control (S-AWC) all-wheel drive system for superior handling. Electric four wheel drive trains give the option to precisely control torque at each wheel in a way that mechanical systems cannot, allowing engineers to design an optimum handling system. Each of the 4 motors is rated for 100 kilowatts, 400 kilowatts total, or 533 horsepower total. The battery pack is rated for 50 kilowatt-hours. For comparison, that size battery pack is double that of the Nissan Leaf. Mitsubishi will face competition from two other similarly powered entries. One, the 2013 Toyota EV P002, has a two motor drive train that also has 400 kilowatts total power, but a 42 kilowatt-hour battery pack. Their 2012 entry won in the electric division. The other entry is new to the Pikes Peak race, hails from Latvia, and also has a 400 kilowatt drive train. "I'm excited to compete here with the MiEV Evolution II. I will do my best, along with my teammates, to make an electric vehicle the champ for the first time ever," says Tracy. Both Toyota and the Latvian entries also have their eyes on an overall win.